Warrington and Halton Hospitals NHS Foundation Trust has been named as one of John’s Campaign’s hospitals allowing open visiting times for relatives and carers of patients with dementia. John’s Campaign was started by the Nicci Gerrard, the daughter of Dr John Gerrard, who was diagnosed with Alzheimer’s in his mid-seventies, and Julia Jones, whose mother June Jones had a similar experience. Dr Gerrard’s experience was the catalyst for this campaign known as ‘stay with me’ to allow open visiting for family and carers to be there to support their loved ones during their stay. Warrington Hospital and Halton General Hospital in Runcorn are supporting the campaign which is known as ‘Stay with me’. Warrington Hospital’s Forget Me Not unit, which opened in 2014, is a purposebuilt unit, with a dedicated team of highly skilled nurses, doctors and allied healthcare professionals providing patients with dementia with specialised care. Family and carers are not restricted from visiting loved ones and are welcomed at any time of the day and into the evening. Staff encourage visitors to come to the ward at a time that suits them and their loved ones and to stay on the ward. While they are on the unit they are encouraged to participate in any care delivery or therapy sessions that they and the patients choose. 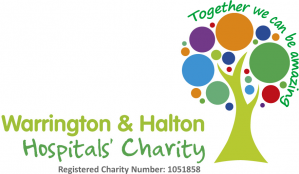 Many other wards across the trust at Warrington and Halton Hospitals have also introduced open visiting from 2.00pm – 8.00pm, as the trust accepts that many patients and families want this and that patients benefit from the support of their loved ones whilst in hospital. 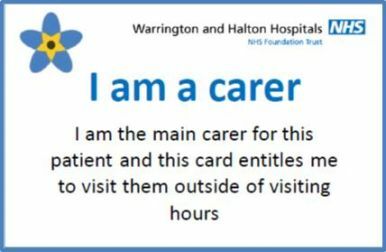 It is now standard practice that when a patient with dementia is admitted to another ward other than the Forget Me Not unit the family are issued with a card that indicates the trust supports them to visit at any time even if the ward does not usually permit open visiting. We recognise the key role that relatives and carers have in helping us to plan and deliver person-centred, safe and effective care. Please speak to the nurse in charge if the person you care for has memory problems, needs you and you are willing and able to stay with them. You will be given a carers to enable you to visit outside of hospital visiting hours.